Having graduated from Newcastle University in 2013, I am able to teach classical music grades and music theory to students of any age or ability. I have over 6 years experience in teaching students from absolute beginner to advanced level in one-to-one settings. I also tutor at local community fiddle group, Tyneside Fiddle Alliance at St Mary's Church on alternate Thursdays. I aim to offer a relaxed teaching environment, where you can have fun learning and building your confidence as a violin/fiddle player. Whether you are new to playing or returning from a break, lessons will be tailored to your individual needs and interests. You will need to have your own instrument but if you need help in choosing something suitable I would be happy to advise you. I have a spare violin which can be used during the first couple of lessons. ChloeFrom Venia (5/5): Chloe is truly an excellent teacher. I am a beginner myself and I was quite scared of the violin, I thought it was too complicated to start at my age, but Chloe has been brilliant. She teaches you at your own pace, helps you when you need it and honestly makes the lesson fun! ChloeFrom Daniel (5/5): Excellent tutor. Would highly recommend. ChloeFrom Rawan (5/5): Chloe is a brilliant tutor !! I was quite nervous before starting as I don't have a musical background whatsoever but Chloe was very positive, helpful, and kind. Amazingly, I'm noticing myself improving after every lesson ( had 4 lessons) which in my mind is exciting ! 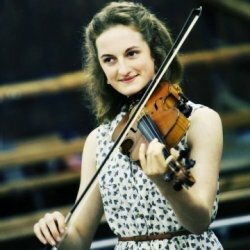 Chloe has amazing teaching skills and I'd strongly recommend her to anyone wishing to play the violin : ) ! Reply from: Chloe: Thanks very much Rawan! A pleasure to teach you! ChloeFrom Paul (5/5): I have been taking lessons for a month now and I'm very pleased with my progress so far. Chloe is very professional,patient and friendly.She is attentive to my needs as a student and I feel I improve greatly each week thanks to her methods,knowledge and ability to explain things in a clear and concise manner. I look forward to further progress and I'm very happy with Chloe as my tutor.